Paul Manley’s solo career now has taken him to major festivals throughout the UK, France, Italy and Malta, and prestigious concert venues including the Barbican, St John’s, Smith Square, the Queen Elizabeth Hall, the Purcell Room, the Queen’s Hall, Edinburgh and the City Hall, Glasgow. He has performed as soloist with orchestras including Bournemouth Sinfonietta and the Scottish Chamber Orchestra and has appeared on both BBC Television and independent networks in addition to BBC Radio 3 broadcasts. Paul Manley studied in London at the Royal College of Music with Jaroslav Vanecek, and in Cologne with Igor Ozim, winning several awards and scholarships. He became a member of the Philharmonia Orchestra at the age of 21, moving to the LPO three years later and in 1983 he became associate leader of the Scottish Chamber Orchestra. From 1984-1987, he concurrently performed with the Academy of St Martin in the Fields and held the post of artistic director with Peterborough String Orchestra which gave several acclaimed performances at Wigmore Hall and St John’s, Smith Square. During this period he frequently guest-led the City of Birmingham Symphony Orchestra, the London Mozart Players, Northern Sinfonia, Bournemouth Sinfonietta and London Philharmonic Orchestra. Besides the five Primavera CDs currently on release, Paul Manley has made several solo recordings, notably a CD of Vivaldi Concertos with Jaime Laredo and the Scottish Chamber Orchestra on Pickwick. Since 1986 Paul Manley has played on a violin by G B Rogeri dated 1680. Martin Smith studied violin with Lionel Bentley and Manoug Parikian at the Royal Academy of Music where he won the Charles Black Scholarship and later with Nicholas Roth and the renowned Russian virtuoso Grigori Zhislin. He was formerly a member of the Duke String Quartet, with whom he appeared throughout the UK and Europe. 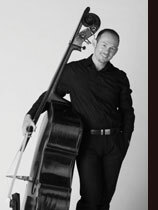 In 1992 he founded the Ellerdale Trio with cellist Melanie Woodcock and pianist Sarah Down. 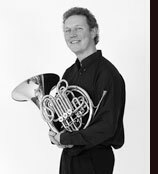 As a soloist, Martin has appeared throughout the UK, as well as in the USA, France, Germany, Holland and Denmark, and made his solo début at the South Bank in 1992 with the LSCO which he has led since 1996. Martin performs as soloist and leader with the Fine Arts Sinfonia and the London Soloists Chamber Orchestra. He also works frequently with many of the country’s leading chamber orchestras and is a member of the London Mozart Players and Primavera. Martin plays on a fine Venetian violin made in 1770. Catherine Musker was a student of Cecil Aronowitz, Atar Arad and Misha Geller winning the Cecil Aronowitz Prize and completing her training at the Royal Northern College of Music in 1983. She was a member of the BBC Symphony Orchestra for two years and, as a founder member of the Balanescu Quartet, recorded Michael Nyman's first three string quartets for Decca. 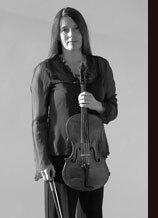 As well as being a member of the contemporary music group Lontano from 1988-2003, she was a member of the string quartet Fourth Dimension from 1996-2000 with whom, as well as giving many performances at music societies around Britain, she recorded Karl Goldmark¹s String Quartet Op 8 and String Quintet Op 9 to some critical acclaim. She is a member of the Michael Nyman Band, sub-principal viola in the Britten Sinfonia and is a busy freelance player, including a busy commercial schedule as guest principal viola with various orchestras including the Royal Philharmonic Orchestra and the BBC Scottish Symphony Orchestra. Andrew Fuller studied with Florence Hooton and Derek Simpson at the Royal Academy of Music where he recently became an Associate. In addition to his schedule with Primavera, Andrew is principal cellist with the New Queen’s Hall Orchestra and the Royal Philharmonic Concert Orchestra. He is much in demand as guest principal cellist with orchestras including the Royal Philharmonic, City of London Sinfonia, the Hallé Orchestra, the Orchestra of St John’s, the Royal Liverpool Philharmonic Orchestra and The Hanover Band and as a session player in London. 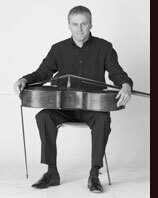 He was associate principal cello with the Royal Philharmonic Orchestra 1991-97. His duo partnership with Michael Dussek has had great success with both concerts and recordings. Their recording of Bantock cello works being selected as Editor’s Choice in The Gramophone. He is a guest player with many ensembles including the Brindisi, Sorrell and Coull Quartets and the Schubert Ensemble. He was a founder member of the York Piano Trio and a member of the Fibonacci Sequence. 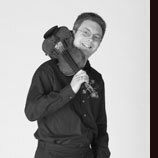 In March 2009 Andrew become a member of the Primrose Piano Quartet, succeeding Bernard Gregor-Smith. ‘A versatile & accomplished artist...’ Classical Music Magazine. Stacey is principal double bass with London Primavera, the London Mozart Players and is a principal with the London Chamber Orchestra. He also appears as a guest principal with larger groups such as the Royal and London Philharmonic and Hallé Orchestras. Much of his time is devoted to chamber music and orchestras performing on recordings, live television and radio broadcasts, as well as having a busy commercial career. He also finds time to pursue his secret passion for performing chamber music at the piano. Stacey made his concerto début on the double bass at the age of thirteen and on the piano at seventeen. He has since won the Eugene Cruft Prize for the Double Bass at the Guildhall School of Music and Drama, where he studied as a scholar. He also appeared live on Russian television and radio after becoming a prize-winner at the Koussevitzky Double Bass Competition in Moscow in 1995. Now forging a busy career as a soloist, Stacey has performed numerous concertos in world renowned venues and is one of the few bassists in England to make regular concerto appearances. He is recognised by other international artists as a remarkable talent and recently performed duo recitals with Steven Isserlis at the Bath Mozart Fest and Wigmore Hall. Well known for his exceptional flare for chamber music, Stacey has had the pleasure of working with some of the world’s finest artists including Julian Rachlin, Nigel Kennedy, Daniel Mueller-Schott, Anthony Marwood and Janine Jansen. Stacey’s new CD Vertigo is his début as a solo recording artist. Other recordings include The London Double Bass Sound with Gary Karr. Future recordings are planned with EMI Début and Hyperion. Anthony Robb trained at the Guildhall School of Music and Drama. After a year's post graduate study with Susan Milan as a Countess of Munster Scholar, he was appointed principal flute with the BBC Radio Orchestra in 1988, a post he held until the orchestra was disbanded in 1991. 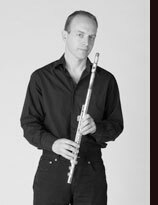 Since 1991 he has pursued a busy freelance career playing guest principal flute with all of London’s symphony and chamber orchestras. 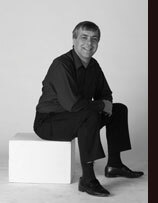 As a soloist, Anthony appeared regularly with Sinfonia 21 performing contemporary works and broadcasting on Radio 3 and European Radio. He has given UK premieres of works by Maurizio Kagel and Takemitsu. He has also performed concertos with the London Virtuosi and the Oxford Philomusica in the UK, Spain, Belgium and Cyprus. Anthony is also in demand as a chamber musician working with London Winds and Pascal Rogé, London Symphony Chamber Players, the Albion Ensemble, City of London Sinfonia Wind Ensemble and Ensemble Cymru. After winning many prizes and awards, including a Mozart Memorial Prize, the first decade of his professional life was spent performing as a member of Sir Peter Maxwell Davies’s group, The Fires of London, as well as giving regular concerts with the London Sinfonietta, London Mozart Players and various London Orchestras. David Campbell is now recognised internationally as a concerto soloist, recitalist and chamber musician and he performs with leading orchestras and ensembles in major festivals in many parts of the world. David Campbell’s extensive repertoire includes new works, many of which have been written for him, but he is equally renowned for his interpretation of the standard masterpieces. His discography of over 20 recordings ranges from Mozart to Maxwell Davies and Messiaen, and he has made countless radio and television broadcasts, both here and abroad. He devised and presented a series of chamber music masterclasses on BBC Radio 3 called, The Finishing Touch and has appeared on Radio 4’s Today and Science Now programmes. David Campbell particularly enjoys chamber music and has played with many leading ensembles and has also been a guest soloist with many eminent foreign quartets including: the Fine Arts (USA), Danubius (Hungary) Copenhagen Quartet (Denmark) Szymanowski (Poland), as well as many leading British string quartets, including the Maggini Quartet, with whom he recorded the Bliss Clarinet Quintet which was released on the Naxos label in November 2004. 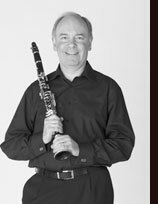 David Campbell is artistic director of MusicFest-Aberystwyth, an International Festival and Summer School held each July; visiting professor and Artist-in-Residence at Canterbury Christ Church University College; woodwind consultant at Wells Cathedral School; clarinet consultant to Besson Musical Instruments and UK chair of the International Clarinet Association. Roger Montgomery studied at the University of York and the Guildhall School of Music and Drama with Anthony Halstead. Interested in contemporary music and authentic performance, he works with most of the leading groups in both fields as horn player and conductor. As a founder-member of Jane’s Minstrels he has given many first performances in the UK and abroad and directed recordings for radio and CD. He has also worked as a conductor with Endymion, New Music Players, Capricorn, Avanti!, BBC Singers, Ondine, Park Lane Group, Southbank Sinfonia and the Composers’ Orchestral Project. In April 2005 he was invited to conduct the Esbjerg Ensemble in the premiere of Morten Olsen’s Ictus for Danish Radio and has recently directed NMP in a series of film scores and new works as part of the British Music Information Centre’s Cutting Edge tour. As a soloist he has performed widely in Europe, the USA and Australia, notably the first solo part in Schumann’s Konzertstuck which he has also recorded for Deutsche Grammophon and Weber’s Concertino for Finnish Radio. More recent performances include solo works by Mozart, Haydn, Vivaldi and Bach with the Orchestra of the Age of Enlightenment and at the English Haydn Festival. He is principal horn of the Orchestra of the Royal Opera House and a Professor at Trinity College of Music. Wendy studied at the Guildhall School of Music with Roger Birnstingl, then principal bassoonist with the London Symphony Orchestra. 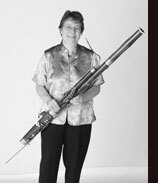 As a student she was also greatly influenced by other great bassoonists, notably Cecil James and Enzo Muccetti, principal bassoonist at La Scala, Milan. She has played as a guest principal bassoonist with the London Philharmonic, Royal Philharmonic, Philharmonia, English Chamber and BBC Symphony Orchestras, as well as many regional orchestras. For several years she was a member of the London Sinfonietta, a founding member of the Koenig Ensemble and appears with other chamber groups. She has performed concertos on the South Bank at the Queen Elizabeth Hall and more recently at the Sheldonion Theatre, Oxford, where she is a member of the City of Oxford Orchestra. During the summer Wendy enjoys coaching at a chamber music week at Keele University and in Ireland at Music on the Shannon, a children’s summer music course. Appointed principal of the Philharmonia Orchestra in 2002, Lucy Wakeford is one of the most outstanding harpists of her generation. Lucy studied with Daphne Boden and Marisa Robles at the Royal College of Music and with Gérard Devos in Paris and Skaila Kanga in London and was selected for representation by Young Concert Artists Trust in 1998. During her studies she won top prizes at numerous national and international competitions including First Prize at the 1996 Charpentier Competition held in Paris, First Prize at the 1991 World Harp Festival Competition held in Cardiff and Second Prize at the 1988 Tenth International Harp Competition in Israel. Much in demand as a soloist, recitalist and ensemble player she has performed at major venues and festivals throughout Europe, appearing as guest artist with musicians including Roger Vignoles, John Mark Ainsley, Michael Chance, James Galway and the Belcea Quartet. 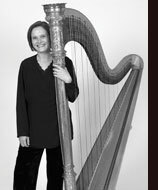 She is principal harp of the Britten Sinfonia and harpist of the Nash Ensemble. Lucy’s engagements have included visits to the Queen Elizabeth Hall, Purcell Room and Wigmore Hall, both as soloist and in performances of works by Britten with Roger Vignoles and John Mark Ainsley. She has appeared at the City of London and Cheltenham International Festivals and gave several performances of Mozart’s Flute and Harp Concerto with the London Chamber Orchestra conducted by Christopher Warren-Green. Lucy also undertook an Arts Council England Around the Country tour with the Wakeford Ensemble and gave recitals in Tunisia. As a concerto soloist, Lucy has appeared with the London Symphony Orchestra, Royal Philharmonic Orchestra, Academy of St Martin in the Fields, Bournemouth Symphony Orchestra, Israel Philharmonic Orchestra, Guildhall String Ensemble, Ulster Orchestra, City of London Sinfonia, London Festival Orchestra and BBC Concert Orchestra, among many others. She has recorded the Mozart Concerto for Flute and Harp with the Britten Sinfonia and Dohnányi’s Concertino with the English Sinfonia on the BMG and ASV labels respectively. Recently described by BBC Music Magazine as ‘an outstanding artist’, Michael Dussek leads a varied career as solo recitalist, chamber musician and singer’s accompanist. He has partnered some of today’s finest instrumental soloists in many of the world’s major concert venues: Amsterdam’s Concertgebouw, Madrid’s Auditorio Nacional, Tokyo’s Suntory Hall, Toronto’s Roy Thomson Hall, Seoul Arts Centre, Taipei’s National Concert Hall and Beijing Concert Hall. He has given more than eighty recitals in Japan alone. British festivals at which he has appeared include Aldeburgh, Bath, Cheltenham, City of London, Harrogate, King’s Lynn, Newbury, Spitalfields and the Three Choirs. His recordings include Britten’s solo piano music, which is highly recommended in the Penguin Guide to Compact Discs and was described by Fanfare magazine as ‘one of the most magical discs of Britten yet made’; a disc of cello sonatas by Prokofiev and Schubert with Ofra Harnoy which won a Canadian Juno Award; and trios by Arensky, Brahms, Bridge and Haydn with the Dussek Piano Trio. He is involved in an ongoing series of recordings for the Dutton Epoch label which have included works for cello and piano by Bantock, Hurlstone, Leighton and Parry with cellist Andrew Fuller. Other discs in this series have included Rubbra’s violin sonatas with Krysia Osostowicz, which was nominated for a Gramophone Award, and Rubbra’s complete works for piano solo. He is a Professor and Fellow of the Royal Academy of Music.